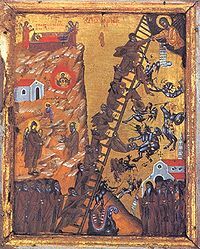 Icon of The Ladder of Divine Ascent (the steps toward theosis as described by St. John Climacus) showing monks ascending (and falling from) the ladder to Jesus. Through uniting with the self we reach the God. I must say this, not with reference to the opinions of the ancients or this or that authority; but because I have experienced it. It has happened thus in me. And it certainly happened in a way that I neither expected nor wished for. The experience of the God in this form was unexpected and unwanted. I wish I could say it was a deception and only too willingly would I disown this experience. But I cannot deny that it has seized me beyond all measure and steadily goes on working in me. So if it is a deception, then deception is my God. Moreover, the God is in the deception. And if this were already the greatest bitterness that could happen to me, I would have to confess to this experience and recognize the God in it. No insight or objection is so strong that it could surpass the strength of this experience. And even if the God had revealed himself in a meaningless abomination, I could only avow that I have experienced the God in it. I even know that it is not too difficult to cite a theory that would sufficiently explain my experience and join it to the already known. I could furnish this theory myself and be satisfied in intellectual terms, and yet this theory would be unable to remove even the smallest part of the knowledge that I have experienced the God. I recognize the God by the unshakeableness of the experience. I cannot help but recognize him by the experience. I do not want to believe it, I do not need to believe it, nor could I believe it. How can one believe such? My mind would need to be totally confused to believe such things. Given their nature, they are most improbable. Not only improbable but also impossible for our understanding. Only a sick brain could produce such deceptions. I am like those sick persons who have been overcome by delusion and sensory deception. But I must say that the God makes us sick. I experience the God in sickness. A living God afflicts our reason like a sickness. He fills the soul with intoxication. He fills us with reeling chaos. How many will the God break? The God appears to us in a certain state of the soul. Therefore we reach the God through the self. Not the self is God, although we reach the God through the self The God is behind the self above the self the self itself when he appears. But he appears as our sickness, from which we must heal ourselves. We must heal ourselves from the God, since he is also our heaviest wound. ~Carl Jung, Red Book, Page 338. Next Next post: Carl Jung: What is it, at this moment and in this individual, that represents the natural urge of life?